Millions of people worldwide spend their valuable time engaged in volunteering. Why? It all starts with the concept of motivation and therefore exploring motivations can provide some answers. Motivation is the reason for acting or behaving in a certain manner. Although all volunteers share a similar behaviour, freely giving their time without financial gain to the mutual benefit of the cause and themselves, they do not necessarily have the same motivations for doing so1. Why is it important to understand what motivates volunteers in citizen science? Because citizen science projects depend on their volunteers, understanding the motivations of volunteers can enhance recruitment, ensure good retention rates and ultimately make the citizen science project a success. Members of the public interested in participating in science have a wide range of opportunities. Citizen science is increasingly used in many different scientific fields, including astronomy, biotechnology, environmental science and ecology. This diversity provides a huge array of projects with very different volunteer tasks, from categorising galaxies or analysing DNA sequences online, to outdoor monitoring of plants and animals, and hands-on collection of air or water samples. It also provides a variety of different social setups for participants to choose from, with projects offering anything from large group activities to individual-based participation. Some projects are based in the local community, whereas others are large mass participation projects running worldwide, providing very different experiences of volunteer communities. Finally, the opportunities to participate in projects at diverse levels vary significantly from basic crowdsourcing, to fully collaborative projects where volunteers work closely with professional scientists to decide which scientific problems to address and how to address them. Projects are not necessarily limited to one level of participation, as exemplified in the National Trust biodiversity monitoring project, “The Cyril Diver Project”2. Here most volunteers were engaged at a medium level and conducted biodiversity surveys whilst a few volunteers were engaged at the top level, collaborating in problem definition, data collection and analyses. Considering all these options and opportunities for participation, it is hardly surprising that millions engage in citizen science projects and that their reasons for doing so are varied. Interestingly, even though citizen science has a long tradition stretching back hundreds of years and currently involves millions of people, the motivations of volunteers in this area have rarely been studied3, and only in the last ten years has this area received any significant interest from the research community. Early research on volunteer motivation developed within the social sector in the 1960s and 1970s and was based on general, and more specifically, employee, motivation theories. However, due to differences between employees and volunteers, such as the lack of remuneration for volunteers, research has since expanded to try to identify which factors drive volunteers specifically. Some features of volunteer motivation have been found to apply in any volunteering context. For example, factors external to the project such as employment status and age can influence volunteer motivations. For instance, younger people were more inclined to volunteer by their desire to gain experience and further their career than older people who were already in a job or retired4. Just as motivations differ between individuals, they can vary for the same individual at different times5,6. The reasons to volunteer in the first place may be different to the reasons given to continue volunteering, either in the short term or as a dedicated volunteer in the long term. This change in motivation can come about not only due to changes in external factors, but also by participation in the volunteer activity itself. In one study, self-directed (egoistic) motivations, such as personal interest, were shown to be the most important for initial commitment for a volunteer, whereas a deeper altruistic reason, such as a concern for the environment, was needed for long-term participation to occur7. In another study, this was reversed; volunteers were initially altruistically motivated, wanting to improve the environment, and only later did self-directed motives, such as enjoying being outdoors, learning new skills and meeting new people, become important8. Whilst motivations do change over time, often more than one motivation is important to volunteers at any one time9. Both self-directed and altruistic motives are often important to volunteers. For participants in any kind of citizen science project, self-directed motives may include: personal interest in the topic under investigation, such as astronomy, protein structure or wildlife; wanting to learn more about the topic; or a desire to discover something new, such as gaining access to new places, species or discovering new galaxies (see Table 1 for details). 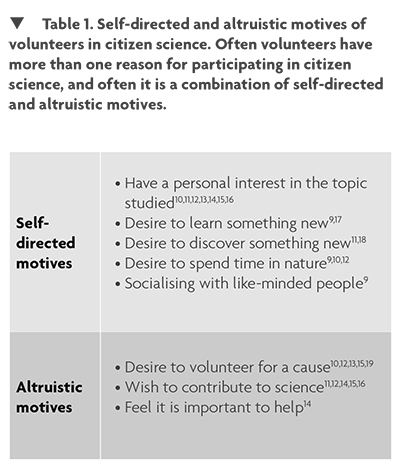 Depending on the type of citizen science project and form of participation, other self-directed motives may be present. For example, volunteering provides an opportunity for recreation and spending time in nature for participants in environmental projects, whereas, social motives are not rated as highly. One potential reason for the relatively low importance rating could be that participation in many projects is carried out alone, whether in online projects or environmental monitoring. This individualistic setup of project participation could deter potential participants who are looking to meet like-minded people and to join a community. To counter this, many projects have set up online forums and use social media to create virtual volunteer communities to provide opportunities for volunteers to meet each other, discuss findings and get support from their project leaders, if needed. Career motives, such as volunteering to gain experience for their CV or to “get a foot in the door” at a desired place to work, are often not mentioned in citizen science research. When career motives were mentioned, it was in the responses from students or young people7,10. Many volunteers in citizen science projects are older (40-60 years old) or retired11,12, and have no need to gain experience or contacts to further their careers. It is now generally accepted that most volunteers have some self-directed reasons for volunteering; however, altruistic motives are often more important than self-directed motives. An important altruistic motive for participants in many different citizen science projects is their wish to contribute to science, a drive that is unique to citizen science and sets it apart from other volunteering opportunities. Other altruistic motives, such as volunteering for a cause or feeling it is important to help, are significant for many as well. Participants in environmental citizen science projects, like biodiversity monitoring, are often altruistically motivated because they are concerned about the environment and feel it is important to help conservation efforts. After understanding volunteers’ motivations, the next step for citizen science projects is to meet these to ensure a high level of satisfaction and thus retention. If volunteers continue for longer, they will understand their tasks better and may therefore be able to perform to a higher standard. This can save resources because of a lower need for additional recruitment and training of new recruits6, and it ultimately contributes to better outcomes for organisations and the causes they work for. If primary motivations are perceived by volunteers to be met, they become more satisfied4,20 and they tend to keep volunteering for longer1,21. However, a recent study has shown that not all motivations are equal in relation to achieving volunteer satisfaction: altruistic motives were positively correlated with satisfaction and intention to continue volunteering, whereas self-directed motives were negatively correlated with satisfaction and intention to continue22. Meeting altruistic motivations of volunteers is therefore key to retaining volunteers. This means projects need to ensure sufficient and prompt feedback to volunteers on how their data contribute to science and therefore to their chosen cause. With the current explosion in numbers and types of citizen science projects, there may be increased competition for volunteers in the future. As we learn more about why people volunteer with different citizen science projects and how motivations can be satisfied, this knowledge can be incorporated into volunteer management strategies that will attract and satisfy volunteers; the end result is that retention will be greater and volunteers will spread the word and encourage others to participate and ultimately help the project succeed. This article is taken from the August 2016 edition of the environmental SCIENTIST. Clary, E. G., Snyder, M., Ridge, R. D., Copeland, J., Stukas, A. A., Haugen, J. and Miene, P. (1998) Understanding and assessing the motivations of volunteers: A functional approach. Journal of Personality and Social Psychology, 74 (6), pp. 1516–1530. Nov, O., Arazy, O. and Anderson, D. (2014) Scientists@Home: what drives the quantity and quality of online citizen science participation? PloS one, 9 (4), p. e90375. Musick, M. A. and Wilson, J. (2008) Volunteers: a social profile Indiana. University Press, Bloomington. Ryan, R. L., Kaplan, R. and Grese, R. E. (2001) Predicting Volunteer Commitment in Environmental Stewardship Programmes. Journal of Environmental Planning and Management, 44 (5), pp. 629–648. Clary, E. G., Snyder, M. and Ridge, R. (1992) Volunteers’ motivations: a functional strategy for the recruitment, placement, and retention of volunteers. Non-profit management and leadership, 2 (4), pp. 333–350. Rotman, D., Hammock, J., Preece, J., Hansen, D., Boston, C., Bowser, A. and He, Y. (2014) Motivations affecting initial and long-term participation in citizen science projects in three countries. iConference 2014 Proceedings, pp. 110–124. The Conservation Volunteers (2014) Volunteering Impacts. The Conservation Volunteers, Doncaster. Bell, S., Marzano, M., Reinert, H., Cent, J., Kobierska, H., Grodzi ska-Jurczak, M., Podjed, D., Muršič, R., Vandzinskaite, D. and Armaitiene, A. (2008) What counts? Volunteers and their organisations in the recording and monitoring of biodiversity. Biodiversity and Conservation, 17 (14), pp. 3443–3454. Johnson, M. F., Hannah, C., Acton, L., Popovici, R., Karanth, K. K. and Weinthal, E. (2014) Network environmentalism: Citizen scientists as agents for environmental advocacy. Global Environmental Change, 29, pp. 235–245. Raddick, M. J., Bracey, G., Gay, P. L., Lintott, C. J., Cardamone, C., Murray, P., Schawinski, K., Szalay, A. S. and Vandenberg, J. (2013) Galaxy Zoo: Motivations of Citizen Scientists. Astronomy Education Review, 12 (1), pp. 1–27. Wright, D. R., Underhill, L. G., Keene, M., and Knight, A. T. (2015) Understanding the Motivations and Satisfactions of Volunteers to Improve the Effectiveness of Citizen Science Programs. Society & Natural Resources, 28 (9), pp. 1013–1029. Weston, M., Fendley, M., Jewell, R., Satchell, M. and Tzaros, C. (2003) Volunteers in bird conservation: Insights from the Australian Threatened Bird Network. Ecological Management and Restoration, 4 (3), pp. 205–211. Davies, L., Bell, J. N. B., Bone, J., Head, M., Hill, L., Howard, C., Hobbs, S. J., Jones, D. T., Power, S. A., Rose, N., Ryder, C., Seed, L., Stevens, G., Toumi, R., Voulvoulis, N. and White, P. C. L. (2011) Open Air Laboratories (OPAL): A community-driven research programme. Environmental Pollution, 159 (8-9), pp. 2203–2210. Hobbs, S. J. and White, P. C. L. (2012) Motivations and barriers in relation to community participation in biodiversity recording. Journal for Nature Conservation, 20 (6), pp. 364–373. Curtis, V. (2015) Motivation to Participate in an Online Citizen Science Game: A Study of Foldit. Science Communication, 37(6), pp. 723-746. Thiel, M., Penna-Diaz, M. A., Luna-Jorquera, G., Salas, S., Sellanes, J. and Stotz, W. (2014) Citizen scientists and marine research: volunteer participants, their contributions, and projection for the future. Oceanography and Marine Biology: An Annual Review, 52, pp. 257–314. Raddick, M. J., Bracey, G., Gay, P. L., Lintott, C. J., Murray, P., Schawinski, K., Szalay, A. S. and Vandenberg, J. (2010) Galaxy Zoo: Exploring the Motivations of Citizen Science Volunteers. Astronomy Education Review, 9 (1), pp. 10103–10118. Finkelstein, M. A. (2008) Volunteer satisfaction and volunteer action: A functional approach. Social Behavior and Personality, 36 (1), pp. 9–18. Stukas, A. A., Worth, K. A., Clary, E. G. and Snyder, M. (2009) The Matching of Motivations to Affordances in the Volunteer Environment: An Index for Assessing the Impact of Multiple Matches on Volunteer Outcomes. Nonprofit and Voluntary Sector Quarterly, 38 (1), pp. 5–28. Stukas, A. A., Hoye, R., Nicholson, M., Brown, K. M. and Aisbett, L. (2016) Motivations to Volunteer and Their Associations With Volunteers Well-Being. Nonprofit and Voluntary Sector Quarterly 45, (1), pp. 112–132.